The Robert Mondavi Institute for Wine and Food Science at UC Davis hosts the Walt Klentz Lectureship Series. 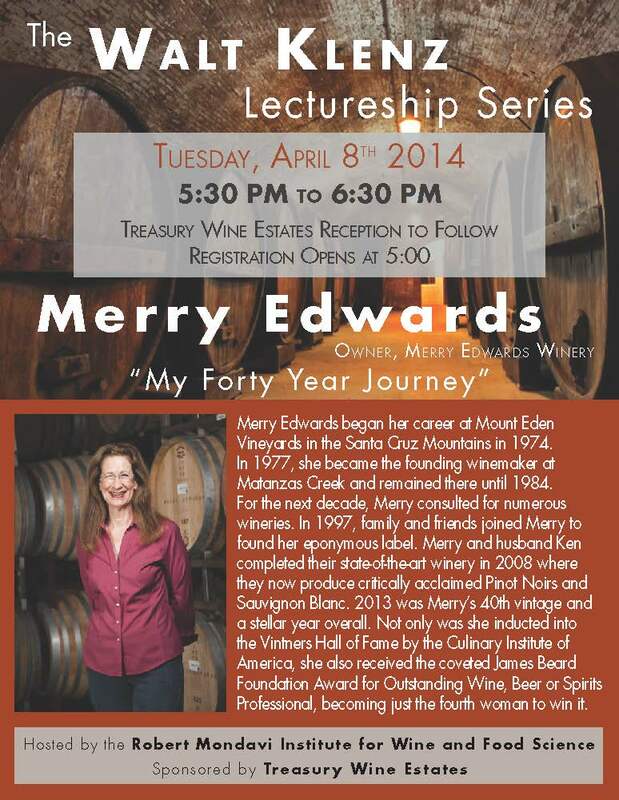 Merry Edwards, owner of Merry Edwards Winery in Sebastopol is series’ next speaker. Registration opens at 5:00pm and seating is no charge. Reception follows the lecture hosted by Treasure Wine Estates. Oops!! The February 23, 2014 blog post on the Lake County Winery Tour indicated a wrong date. The correct date for the tour is Saturday, June 14. Click here to take you to the February 23 blog post that has the tour’s details. Contact Sonia Baron at soniabaron@hotmail.com and 916 825-4952. Alison Crowe is the featured guest speaker at SHW’s March 19 meeting when she’ll be talking about the joys and hiccups on making Pinot Noir. In addition to making wine for her partnership and consulting for other wineries, Alison writes a monthly column for WineMaker magazine – she is the Wine Wizard, answering questions posted by readers. Alison is also the author of The Wine Maker’s Answer Book, Solutions to Every Problem, Answers to Every Question. In this book, Alison covers everything from funky smells to identifying mystery grapes that might be growing in your backyard to solutions for turning so-so wines into something you could be proud of. Her response to questions is practical and straight-forward. Wanting the best for its members, SHW is planning to pre-order Alison’s book at $15 each (includes tax and shipping). Furthermore, SHW has also arranged for Alison to personally sign your copy at the March 19 meeting. Her book makes an inspiring gift for the wannabe winemakers in your life, and a welcome reference for all winemakers. Please indicate your interest for Alison’s book to Sonia Baron by Monday, March 3; Sonia’s contact information is at the head of this post. Polish off those bottles you’ve been saving for competition! Entry dates for the California State Fair is quickly approaching. Wine and label entries will be accepted March 17 through April 18. More information can be found at this link: State Fair Home Wine Competition Flyer. In addition to SHW’s Jubilee Wine Competition, the California State Fair Home Wine Competition is one of the required contests for members to compete for SHW’s Winemaker of the Year (WOY) Award. SHW’s 2014 Jubilee Wine Competition is planned for Saturday, June 28 with the Jubilee picnic on the following day, June 29. 2014 Jubilee information will be published soon. The 2013 WOY competition information can be found here. Information on other home wine competitions can be found here. If interested in volunteering, contact Tom or Rebecca Ramme at wineevents4fun@gmail.com by Friday, March 14. “…This competition has a rich tradition and is dedicated to increasing the knowledge, skill and abilities of amateur winemaking. We are so excited that this event is back on for 2014 and it can’t happen without the dedication of our fabulous volunteers! If interested in volunteering, notify Tom or Rebecca Ramme at the email address at the top of this post by Friday, March 14. State your availability and your job preference, if you have one. Following your response, you’ll be sent a confirming email with additional instructions and details. SHW member David Hicks is coordinating a one-of-a-kind winery tour around the Lake — Lake County that is, on Saturday, May June 14. For everyone’s maximum comfort, David’s contacted the area’s trusted tour van company, checked out the best bed and breakfast in the county, and is making tour and “meet the winemakers” arrangements at 4-6 wineries. If that’s not enough, David’s also letting us party at his home for an evening BBQ to conclude this exciting event. David is looking for a volunteer to help coordinate the soiree at his home along with a small committee to help ensure all comes together. Details for this fab weekend can be found at this link: Lake County Winery Tour. David requests that for those who signed up at last week’s SHW meeting to reconfirm their interest by contacting him. Barrels for Sale! m2 Winery in Lodi are selling used barrels for $ 75.00 each. They have different types to choose from. Contact JD Phelps at jdphelps@gmail.com or Sonia Baron at soniabaron@hotmail.com. The February 19 meeting is the evaluation of members 2013 white and rosé wines (non-dessert wines). The evening’s evaluators are Craig Haarmeyer, winemaker with Sacramento’s Revolution Wines, and winemakers Grover Lee and Kevin Luther with Wise Villa Winery in Lincoln. you’ll be asked to briefly share your winemaking notes (please come prepared): varietal; vineyard; harvest date; brix; pH; acid; TA; yeast; any adjustments made; any additives and special treatments; and fermentation temperature. 2013 Chardonnay varietal focus group wines will be evaluated at another meeting so please do not bring those to this meeting. 2013 Primitivo Beginning Winemakers varietal focus group members are requested meet at 6PM at the Turn Verein. Bring a 1 ounce sample of your Primitivo for malo-lactic completion testing. Thanks to everyone for bringing your own two wine glasses for use, and for helping set up and cleaning at the meeting. Only members wines are evaluated, so if you haven’t already, please remember to bring your 2014 membership dues; 2014 SHW Membership Form. Renewing by March 1 helps keep your WineMaking magazine subscription delivered to your mailing address. Our new newsletter editor, Holly Heggli has assembled an informative and lively newsletter for your reading pleasure. Read up about all the activities planned for the next few months.